Here’s a recent blog about my work as a minister in the Department for International Development, also available on the Huffington Post. Twenty years ago the world took an important step in agreeing that population is not just about measuring the numbers of people in the world, it is about the quality of lives of individuals and that every person counts. At the heart of this agreement was the recognition that gender equality should be a global priority, and that making decisions over your own body is a human right. Significantly this included the rights of women and girls to make decisions about their reproductive life free of discrimination, coercion and violence. Since then we have made remarkable progress. Fewer women are dying in child birth, more girls are going to school, increased numbers of women are taking on roles in public office, there are more female entrepreneurs and less poverty. But significant challenges remain, and we are still a long way from achieving universal access to reproductive and sexual health and the realisation of reproductive rights for all. 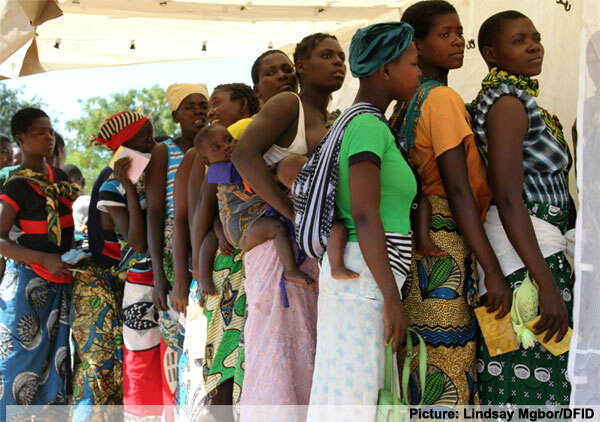 Women queue to be registered for free family planning services in Malawi. These figures are staggering and what makes it all the more astonishing is that after 20 years there is still so much resistance to women and girls having a right to decide what happens to their own bodies. Yet again this year progress at the Commission on the Status of Women (CSW) was stalled by negotiations on wording around reproductive rights. While ultimately the event was successful, why after 20 years since the International Conference on Population and Development (ICPD) and 58 years of the Commissions on the Status Women, are reproductive rights still being used as a bargaining tool in women and girls’ progress? The successes of previous years have been hard fought and we cannot accept attempts to undermine them. Achieving gender equality means allowing individuals to make decisions over their bodies, and this doesn’t just mean through ensuring reproductive rights, but also by eliminating violence against girls and women and practices such as female genital mutilation and child early forced marriage. This week I will be attending the Commission on Population and Development at the United Nations, as I did CSW, to not only to call on countries to uphold the commitments they made 20 years ago, but also to recognise that the world has changed since 1994, and emerging challenges also need to be addressed. It is not acceptable that each year 75million women and girls face an unintended pregnancy and that 22million are desperate enough to have an unsafe abortion despite the risks of the death, disability and, in many settings, imprisonment. For me the argument should not be about the rights and wrongs of abortion but about providing women and girls with the freedom and services so that they can make their own choices about their own lives without discrimination. The Department for International Development (DfID) has taken a leadership role in committing to reproductive rights. Our International Family Planning Summit in 2012secured commitments to give 120million more women access to family planning helping to stop 200,000 women and girls from dying in pregnancy or childbirth and saving the lives of three million babies across the world’s poorest countries. By 2015 DfID alone will have given 10million women access to modern methods of family planning, enabling more women to delay their first pregnancy, as well as committing to providing increased skilled birth attendants, particularly for the poorest and most marginalised. Reproductive rights should be guaranteed for all, without discrimination, otherwise we will not only fail to achieve the objectives of the ICPD, but also fail women, girls as well as men and boys, across the world.